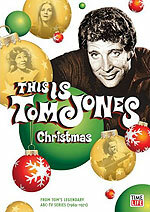 DVD review: "This is Tom Jones: Christmas"
The second DVD release from Time Life taken from singer Tom Jones' ABC TV series that ran from 1969-'70, this single disc collection takes in the two shows that ran the evening of Christmas both years. Jones ran a variety show, and so there is precious little talking  mostly singing and occasional comedy bits. Because Jones appealed to the youth market, even these Christmas Day broadcasts contain a lot of non-holiday music. Still, Judy Collins doing "Chelsea Morning" or Ella Fitzgerald belting out "Good Morning Blues" is worth hearing any day of the year. And it remains impressive how utterly at ease Jones is across just about every popular style of music. On these two episodes, he delivers a stunning cover of the soul and country classic "Patches," caresses the American standard "Brother, Can You Spare a Dime?" and rocks out to Little Richard's rock 'n' roll gem "Tutti Frutti." And when he does bring the music to the seasonal material, it's pure magic. The 1969 show featured Jones joined by the fellow Welshmen of the Treorchy Male Choir for a medley of traditional material. In the 1970 show, he invited the stellar choir back to back him and Fitzgerald. If at times dated (there's an Austin Powers vibe throughout most of the choreography), Jones was (and remains) such a powerhouse singer that the listening is pure joy.